Recently, I got a chance to try Ban Labs Sesa Master Mind herbal hair oil. Today, we can find many hair oil based products available in the market because hair related problems are very common in India. The first product of Ban Labs was Sesa Hair oil, which is established well in the market and many people are using it. Whereas Sesa Master Mind Hair oil is a comparatively new product and it is not freely available in the market like the simple Sesa Hair oil. Ban Labs has developed Sesa Master Mind Hair oil for providing mental relief in the present stressful life. The company says that there are 21 essential herbs and 12 oils in it which provide mental calmness and sharpen one's memory. The company further says that Sesa Master Mind Herbal Hair oil increases the blood circulation of the scalp and it nurtures the calmness and control of mind. It keeps our brain healthy, sharp and sound, thus increasing concentration and memory power of the brain. Ban Labs recommend this product to the students, working professional or people suffering mental stress. The good point about this oil is that it is made through Kshirpak Vidhi mentioned in the ancient scriptures of Ayurveda. I got a chance to use Sesa Master Mind through the free samples and I gave it a try when I was feeling depressed. The good point of this oil is that I immediately see positive signs in my mood and stress at my head decreased significantly, then I started using this oil regularly, whenever, I was feeling down and it worked everytime. In the present world, it is very common to see people suffering from mental problems because of increasing pressure of life, work, society and family. 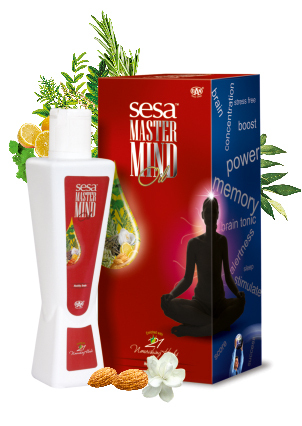 Here Sesa Mastermind Herbal oil can provide some relief, though, it can't solve our problem; however, it can provide us some mental calmness and relief. Mastermind is a product which is introduced to solve the present day problems. There are many studies which all says that numbers of people suffering mental health problems are on the rise. Such people can get some relief from this oil, which is a good product and it works too. However, the sad part is that it is not freely available and you struggle hard to get it. I will give this product a rating of 9 out of 10 because of its effectiveness.